An interesting development in the world of Sport Class Air Racing this week... A December 16 press release (see full release below) announces the Sharps partnering with Kevin Eldredge to manufacture their promising new design airplane, the NemesisNXT . The first kits delivered by the Sharp's were produced in the couple's hangar at Mojave Airport in southern California. The move to Eldredge's much larger facility indicates that production will likely be ramped up with the delivery rate of NXT kits increasing substantially. To date, three completed airplanes have been seen at Reno. 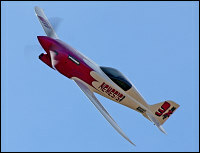 In June, Dan Wright brought his finished NXT to the Reno Air Race Association's Pylon Racing School, a landing accident shortly thereafter kept him out of competition for the September event. 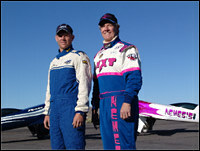 Both Sharp and Eldredge raced their aircraft at the Reno National Championship Air Races this year with Eldredge finishing a respectable third in Sunday's final. Sharp had to pull out of the race with mechanical problems and was listed as a DNF. Though the kits are sold as personal transportation, buyers will undoubtedly have an eye on racing their completed airplanes. How many of the future deliveries will eventually be raced is unknown at this time. Nemesis Air Racing today signed a worldwide exclusive agreement with Kevin Eldredge, owner of SLO Air Inc. to manufacture and distribute the Nemesis NXT Sport Aircraft kit. Over the last 5 years Jon and Patricia Sharp have been designing and developing the NXT kit. Designed from the ground up to be one of the fastest piston engine airplanes ever build, the NXT is the ultimate in personal transportation. A total of 6 complete kits have been delivered to date. SLO Air's 12,500 foot facility at the San Luis Obispo, Ca airport will provide the program with world-class manufacturing, and customer support to match the world class NXT. Delivery of the first NXT production kit will be March 1st, 2006 with subsequent deliveries every two months through 2006. At press time the first two delivery positions where taken and several others are pending now that the formal distribution agreement is finalized. 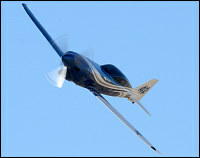 Jon Sharp, a 12-time winner at the Reno Air Races, is also senior material engineer at Lockheed. Jon explains, "Competition drives us in everything we do. Racing is in my blood, and the thought of handing the competition an NXT to race against me can be a little unnerving. I've learned however, that what is most important to me is being the best I can be, as a builder as well as a pilot." "Our partnership with SLO Air Inc is simply another significant step in many that brings us closer our dream of offering this extraordinary aircraft worldwide." notes Patricia Sharp. "Im thrilled to have Kevin Eldredge join us in our quest. Kevin was one of the first to purchase and fly the NXT kit and as you will soon find out is as exited as we are about the experience. His obvious enthusiasm and the business experience are a welcome addition to our team." Work is progressing on SLO Airs first production kit. "With the close assistance and supervision of every aspect from material selection to final production from the Sharps, I am confident we will deliver a truly exceptional kit aircraft and building experience for our customers," explains Eldredge.